Condition: Very good. Fold as issued. Slightly wrinkled along fold. Wide margins. Margins partly strenghtened on verso. Verso: French text. 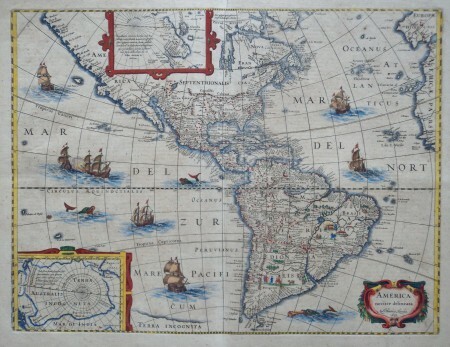 This beautiful and popular map of the Americas was emulated by numerous cartographers and went through various editions. 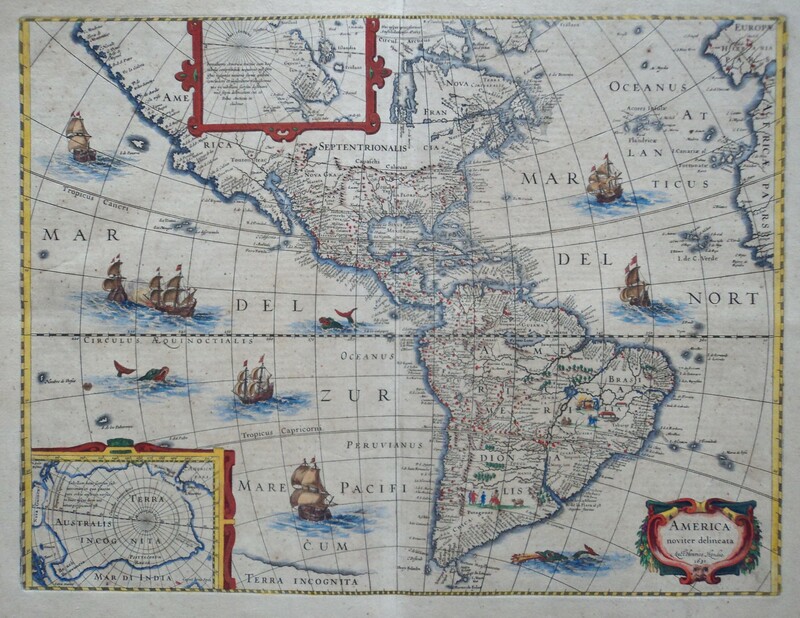 Originally issued by Jodocus Hondius II in 1618 with carte-a-figures borders, it was derived from two earlier maps by Blaeu. North America retains the peninsular California and the East Coast is beginning to take shape, although it still lacks detail in the mid-Atlantic region. In the Southwest, the famous seven cities of Cibola appear on the banks of a large lake. In South America, there is a large inland sea on the equator and two engraved scenes - one detailing a cannibalistic feast. Two stylized insets of the polar regions are enclosed in strapwork cartouches; the North Pole depicts Frobisher's theory of the Northwest Passage and the South Pole shows the long-held notion of the mythical southern continent. The map is richly ornamented with a strapwork title cartouche, fleets of ships and sea monsters. Shortly after Jodocus Hondius' death in 1629 the plate passed into the hands of his brother, Henricus. The borders were removed to facilitate the smaller atlas. This is the third state with the imprint of Henrico Hondius and a date of 1631.